We decided to get away for a night on the weekend of Father's Day....so we headed to Mesquite to spend a night at the Casa Blanca and take advantage of the sunshine and the pool! Maddux was in heaven with the pool and especially this water slide! He LOVED it! I took him down it only once because most of the time I spent out of the pool with Ambrie but Greg took him down it so many times! I loved sitting at the edge of the pool with Ambrie on my lap and my feet in the water watching my two boys just play and play and play! It was so nice to get away and enjoy great food, a beautiful pool, and time to relax with my three favorite people! A full length shot...all the flowers, beads, and lace are from my Mom's wedding dress. This picture does not do it justice, it is beautiful! My Mom is such a great Grandma. She has so many grand kids yet still finds time to do thoughtful and special things for each of them...and for me too. I couldn't be more lucky to have her as my Mom. Thank you Mom...from both of us!! We took Maddux and Ambrie to Disneyland for the first time this summer and had so much fun! We went with Greg's parents and his sisters family. I was worried that Maddux wouldn't like the rides and that it would be hard having a newborn along for the ride but it turned out to be such a fun and exhausting day! Here we are on the very first ride of the day...the new Toy Story ride in California Adventure...it was a 3D shooting game where you got points for shooting targets. It was such a cool ride. I did horrible because I had Ambrie attached to the front of me but Greg and Maddux did pretty good. We spent most of the day on all the kids rides since this day was all about them. This was the Dumbo ride and Maddux was making us go up and down so fast that I thought we were going to break the ride. Greg and I were laughing so hard and as soon as it finished Maddux wanted to go again. This was my favorite Mom moment at Disneyland...Maddux is one of the BIGGEST CARS fan ever! He has all the toys and has seen the movie a million times. When we walked up to these two life size characters he was in awe. He got so excited and said "Hi Mater!" :) He loved touching lightning and asked if he could go for a ride in him. It was the best part of the day for me. Well worth the trip! He also loved seeing these two again in the Pixar Parade which was awesome...I totally recommend it! It was an amazing day and Ambrie was so good. We actually got to ride more rides than I thought we would and Maddux got to play with some of his favorite people, Daddy, Grandma and PaPa, & cousin Nate for the whole day in the happiest place on earth...What could be better than that? While in California visiting Greg's parents we spent a day at a huge aquarium. It was so much fun! They had HUGE fish tanks and petting areas where you could see sharks, sting rays, sea lions, otters and more. It was very cool. Here is Greg, Papa and Maddux at their favorite part...the shark petting pools...Greg could have spent the whole day right here. It was such a fun day and the perfect way to spend an afternoon with Grandma and Papa! Ambrie is already 2 months old and I can't believe it! She had her 2 month appointment this week and she is exactly 10lbs. Here she is sitting up like a big girl in her Bumbo...so cute! Maddux has been growing too and loves getting into things. One day we found him with about 20 bandaids stuck all down both arms. And on this day he was caugth trying to give Boca (our dog) a shower. Yes...that is the WHOLE BOTTLE of purpole dog shampoo dumped out in the shower and on the dog! It was a disaster and we had to give both Maddux and Boca a bath to get the mess cleaned up. We sure love this little guy...he keeps us on our toes! It was very bitter sweet to say goodbye to my class this year. I was able to go back from maternity leave for the last three days of school to finish up the year with my 4th graders. It was sad to say goodbye to this great group of kids. It will be my last year teaching 4th since I have taken a half day Kindergarten position at my school next year so that I can be home with my kids more. It made saying goodbye even harder. I know it is the best move for me right now but I am sad to leave my colleagues and friends in the upper grades. I am excited and a little nervous for the change. Maddux loved Easter this year! Here he is helping dye easter eggs! Here is the Easter basket after he followed the ribbon path and found it! We spent Easter at home this year since it was so close to my due date. It was fun to do it at our house but we missed being with family! Greg's parents (PaPa and Grandma Harris with the kids! 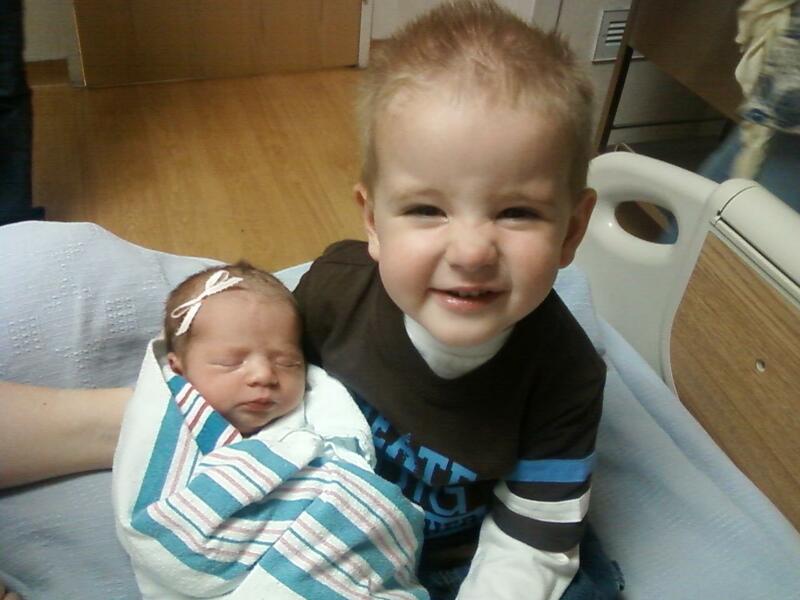 Ambrie with her cousin Brandon (Janae's little guy) who is just six weeks older than her. The new big brother. He is so sweet with her and loves kissing, holding and looking at her sleep. Right at the beginning he struggled with not having all the attention but now he loves her so much. When he hears her crying he always says "It's okay Baby Ambrie" and he also tries to give her the paci and sing to her when she's sad. She came home a perfect and healthy little girl. She has a little acid reflux which caused her to gain weight slowly at the beginning and she spits up constantly but other then that she is as sweet as they come! We love you baby girl! Day at the LA Zoo!! 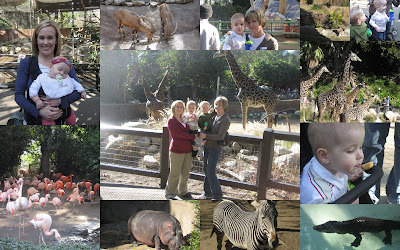 Over Christmas we had the opportunity to go to the LA Zoo for the day with Grandma Harris, Aunt Taryn, and his cousins Nate and Macy. Maddux LOVED seeing all the animals up close and being out in the sunshine! It was such a fun day! I wish we lived closer to a zoo so we could go more often! On Maddux's birthday, after opening gifts first thing in the morning Greg and I took him out to breakfast to celebrate! We even let him sit next to Greg like a real big boy would...which resulted in a very wiggly meal! He picked out the smiley face pancake with "nanas", "ice cream" and "staberry" on it! I didn't get any pictures but that night we all went to a SUU basketball game ...which he thought it was really fun. Happy Birthday Sweetheart! You have made the last two years an amazing adventure. I feel so lucky to be your Mom!